Last week’s blog kicked-off a series on knowledge management in a professional services business. This week, I want to progress from some of the theory discussed there, to look at how you can practically bring a knowledge management strategy to life. I will do so by referencing how we went about this at Moorhouse Consulting during my MD years; hopefully, it serves as a pragmatic example of how you can get beyond the soundbite of this term and, at the very least, might serve to give you one or two ideas that you can similarly initiate with immediate effect. First off, I would commend you to authoring a short document that captures your knowledge management strategy – to present and share with your colleagues. Much of what I am about to discuss here can be contained in such a statement of intent. First off, however, there is a critical decision to make with respect to the fundamental type of knowledge management strategy you seek to deliver. Fundamentally, as a simplification, knowledge management strategy can be defined on a continuum of two extreme poles. Whilst you can place your flag anywhere along this continuum (and I would strongly encourage you to consider both ends), I would also encourage you to declare a clear asymmetric preference or leaning. Let me first, paint the two extremes and then I will declare my personal preference and recommendation. At one end, as expanded on by Hansen et al (1999) and summarised in the table below, you have a knowledge management strategy that focuses on codification. A codification-centric strategy is primarily concerned with linking people-to-artefact. Such strategies will invest heavily in knowledge taxonomies, knowledge-tagging and search engines. 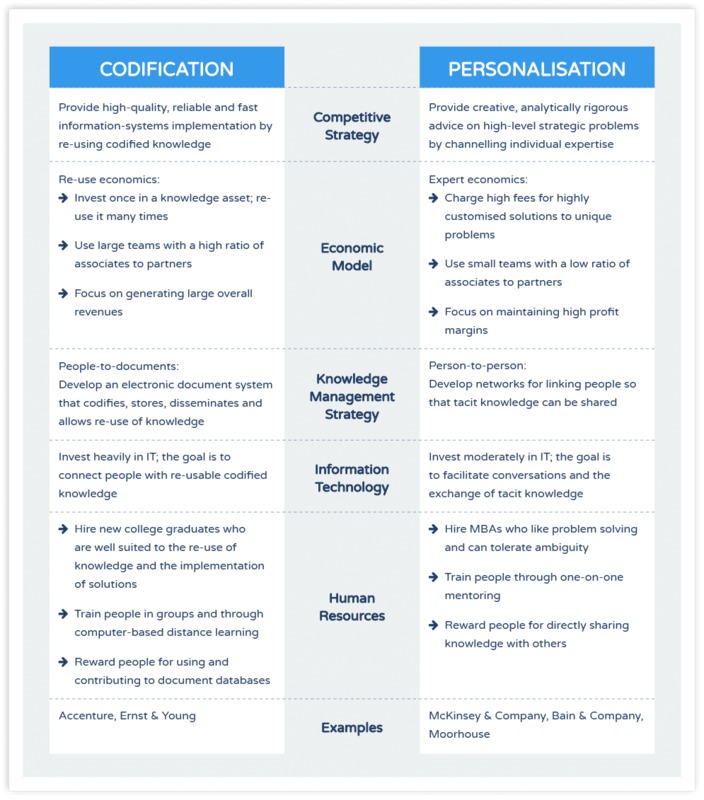 At the other end, you have a knowledge management strategy focused on personalisation. A personalisation-centric strategy is primarily concerned with linking people-to-people. Such strategies will invest heavily in the human and social side of this equation to ensure, for example, that 90+% of the team know 90+% of the team (that is both know their colleagues and know what their colleagues know). To repeat, any coherent knowledge management strategy will need to include aspects of both codification and personalisation but it is important – as a first decision – to declare your dominant bias. To this end, I strongly lean towards a personalisation-centric strategy. For me, the success of a professional service firm lives-or-dies on the social team-dynamic you are able to foster (see, for example, my previous research on high-performing teams). As such, I was always set on ensuring that the human side of the equation received our key focus. As an aside, if your professional service firm, or practice area, is less than, say, 120 members I would encourage you to actually regularly assess this 90/90 test and hold yourself accountable to maintaining this gold standard. 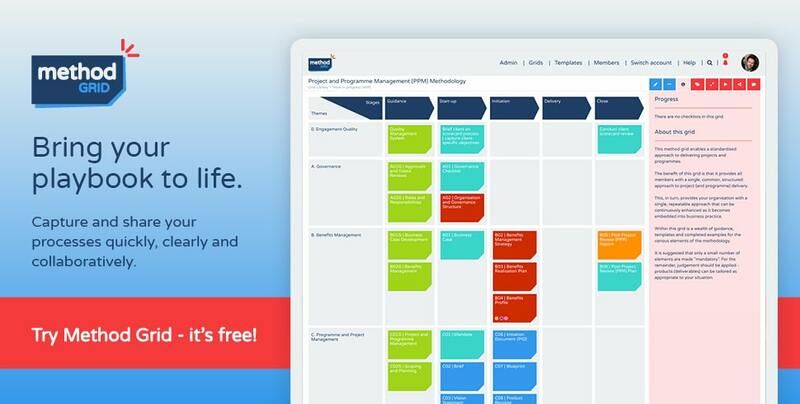 With that primary question answered, you can now capture the essence of a practical knowledge management strategy by setting out the foundations, the key enablers and the actual levers you seek to initiate within this strategy. By levers, I mean practical initiatives, ideas or new capabilities to introduce. See below for the schematic of such a KM strategy. Let me conclude this week’s essay by talking to these key foundations and enablers. Next week, I will unpack – as an illustration – eight example levers. By foundations, I am talking about the core tools, resources and assets that you constantly pull on to bring your strategy to life. This will include the hard and soft aspects of your organizational infrastructure i.e. technological and human. It will also refer to your intellectual property assets – your service methodologies, your developed tools, solutions, case studies, thought leadership etc. Of course, all such foundational aspects require constant investment and evolutionary improvement and your new KM strategy should talk to this. 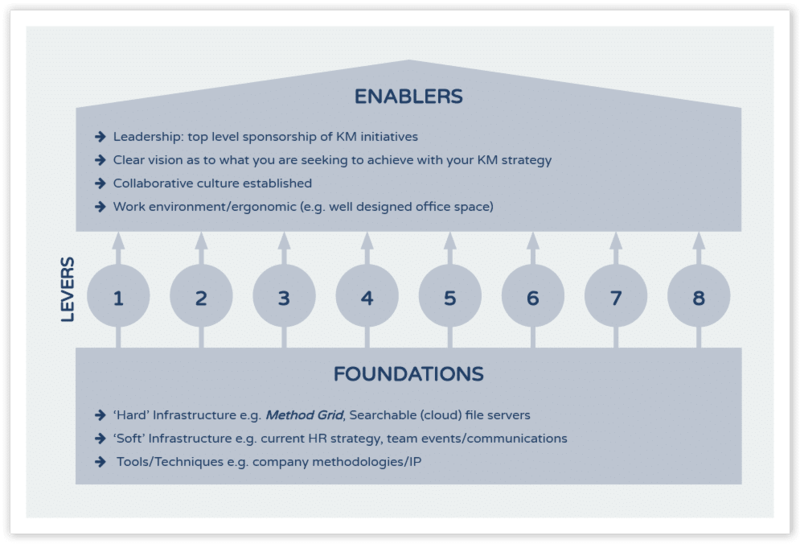 As a related aside, Method Grid was, clearly, built out of a desire to support professional service organisations with this foundational KM-infrastructure challenge. In this respect, somewhat uniquely, it supports both the codification-personalisation and hard-soft dimensions – supporting as it does the development of methodology, searchable IP but also the facilitated linking of people-to-people at the most granular levels of organizational knowledge. By enablers, this simple example emphasises a few aspects that are especially germane for a personalisation-centric knowledge management strategy. Firstly, the importance of a committed leadership team. Like most aspects of professional service firm capability development, there is little point heading off on it, if the leadership team are not fully aligned and committed to personally champion and role-model the initiative. If this is not in place, don’t even start it – as you may well even go backwards in your efforts i.e. all that results is ambiguous practice and confused, disenfranchised team members. The success of a personalisation-centric strategy is also hugely determined by the culture of the firm; to be successful it needs to be one that is genuinely collegial and collaborative – a place where colleagues naturally share ideas, advice and knowledge artefacts between each other – not because of the implied reward (albeit recognition for such behavior is important) but just because, inherently, that is how people behave around here. 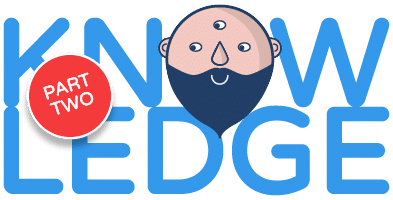 Next week, I will continue this sub-series on knowledge management by starting to detail out a number of these illustrative practical knowledge management levers (ideas, initiatives, tools etc) that further bring such a knowledge management strategy to life. I will also suggest where you should be on this journey contingent on your team’s size. Hansen, M. T., Nohria, N. and Tierney, T. (1999) `What’s your strategy for managing knowledge?‘, Harvard Business Review, March-April, pp. 106-16.